I am not the most organized person in the world. But I get stuff done so everyone assumes I am super organized, but not so much. For the most part, I am OK with (and even enjoy) a little chaos, but my messy handbag drives me crazy. My bag is a place where things go and are never seen again. I spend what seems like half my day searching for stuff in my bag. All my bags are either too small, too large, too narrow or too heavy. Ugh. I have yet to find the perfect bag for myself. But I have found the absolute perfect bag for Ruby, which is progress, right? The Fido to Go Bag is my new favorite thing! Please note: This post contains affiliate links. If you click through and make a purchase through Amazon, we will receive a small commission and be incredibly grateful. The Fido to Go Bag has a comfortable adjustable strap that can be worn over the shoulder or across the body for super easy, handsfree walking. The bag stays put when you are moving, but is also quick and easy to access when you need a treat or bag for pick up. The Fido to Go Bag comes with everything you need for short walks, longer hikes, or road trips – water bottle, collapsible water bowl, bag dispenser and bags. Everything fits nicely in the main compartment, leaving two additional zippered pockets and two mesh side pockets for random stuff. I keep everything in the bag so it’s always ready to go – one small area of my life is now organized! The Fido to Go Bag has zippered pockets on the front, back, and inside as well as mesh pockets on each side, perfect for treats or your phone. There’s a place for everything! Before Fido to Go, I would often have poop bags shoved in my pockets with my house keys. When I would take out a bag to clean up after Ruby, my keys would always fall out. And then there was my phone – specifically what to do with it when picking up poop. With Fido to Go everything has a place. My keys and phone are in one pocket and bags in another. No more fumbling, life is good. And did I mention that’s it’s also incredibly LIGHTWEIGHT. 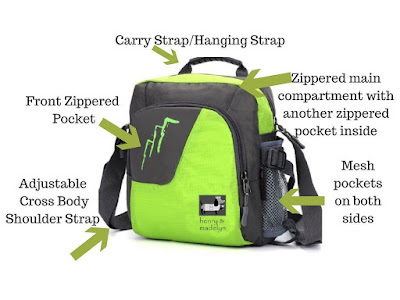 The bag is made from lightweight nylon so no more hurting your back or shoulder. The Fido to Go Bag is one of my new favorite finds! Whether you are walking around your neighborhood, hiking in the woods, exploring a new city, or taking a long distance road trip, the Fido to Go Bag is a great go-to dog bag. My search for the perfect bag for me continues, but at least Ruby is all set. Let’s Go Fido has generously provided a Fido to Go Bag for one lucky reader. We are also going to provide a special surprise in one of the zippered pockets – because there’s so much room, why not! The Fido to Go Bag was created by a husband and wife team out of their love for dogs and desire to make life easier. To learn more, follow them on Facebook, Instagram, and twitter. Disclaimer: This post is sponsored by Let’s Go Fido. I was provided with the Fido to Go Bag in exchange for an honest review. I am selective and only share product information that would be helpful or relevant to my readers. love it… everything is well organized and you haven't to start a treasure hunt first when you need something … 4 paws! Not only would this be great for when I walk or go hiking with my own dogs, it would be great to have when I'm working with rescue dogs. I'm a volunteer rescue transport driver, and we give the dogs potty breaks between each leg (although sometimes I do a "double" leg and they stay in the vehicle a little longer). One thing I always seem to forget is something to carry things like poop bags with. We always clean up after the dogs. i would use it when i go to the vet, because i take treats and water, out walking with my girls and also when i go to dog events. i love this bag, so convenient. i always take bottled water and a cup with me because i dont let them drink city water or out of community water bowls. i also take bags with me. Looks like a nice idea for people who need to carry a lot of stuff with them. Love the fun color too. That sure does look like a great bag for any kind of use. I could carry all the cat stuff outside in it. You all have a great day. Wow – what a neat and useful bag! That looks like just the ticket for our upcoming road trip! Thanks, Ruby! That is a very cool bag and you are adorable sweet Ruby! That looks like a super bag, although, if I might venture to be a wee bit critical for once, I feel that this review did not place enough emphasis on the value of being able to carry a plentiful supply of treats around and avoid unsightly bulging pockets…Toodle pip!Bertie. I would use the Fido to Go Bag for dog walks. That's a great bag. We just use pockets…BOL! I love taking my boys on roadtrips. This bag would so make it easier to just get out and go! Necessity is the mother of invention…even for dogs! I have really good luck with Baggallini bags; I keep getting smaller and smaller ones! Wear them crossbody, leaving my hands and shoulders free. We do short walks with Eddie, but I could still see this bag coming in handy! Great review! And what a perfect model for this photoshoot! What a cool bag! And it's so nice seeing Ruby and your daughter enjoying that quality time together. :)Thank you so much for your condolences and kindness about our sweet baby Zoe's passing. They are of great comfort to us, and we are so grateful for you. I need a new bag for walks. My current purse is a little too small to fit everything in there. Looks like a wonderful accessory for someone with a pup. our little dog tiny loves to go with us everywhere. I have a toddler so i keep a diaper bag and I store tinys stuff in it to. I would love to have her own special bag I cant believe I never thought of that before!